How Does Reptile Shipping Work? Please carefully read these terms. You must understand and agree with our conditions of sale before making a purchase. If you have any questions or would like to pose “what if” scenarios, please contact us before making a purchase. 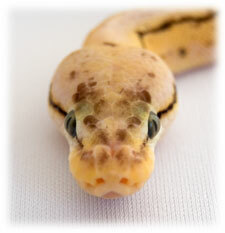 Our terms are not unlike those you will find from most reputable reptile breeders. Taking the best possible care of our animals before selling one to you. Our animals, regardless of their financial value, are meticulously maintained. This includes regular feeding, fresh water and clean bedding. Cages are checked daily and cleaned as necessary. All of our animals are kept in a climate controlled facility which was built specifically for the purpose of keeping reptiles. We do not sell animals that are not ready to be sold. Every animal we sell is feeding regularly and is apparently healthy. ECRB is in the captive-bred animal husbandry business. Captive bred animals kept under optimal conditions normally thrive. We avoid wild-caught animals and animals from questionable sources. If you would like an animal to be inspected by a qualified veterinarian prior to the sale we will work with you to accommodate. However, any costs related to such a visit (including transportation, vet fees, etc.) are your responsibility. Being completely honest and up front about an animal prior to the sale. When we advertise an animal on-line we try to be as descriptive as possible. If there is anything not normal we state it in our advertising. We will also gladly answer any additional questions you have. We ship all animals using high-quality packing materials made specifically for the safe transportation of reptiles. We are approved by both FedEx and Delta for reptile shipping. 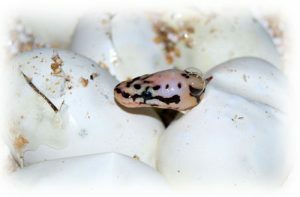 Genetics are 100% guaranteed for animals produced at the East Coast Reptile Breeders facility. Each heterozygous ball python morph comes with a Certificate of Genetics that is signed by Colin Weaver, owner of East Coast Reptile Breeders. This certificate is provided at the time of sale or, in some cases, mailed separately because of its size (e.g. it doesn’t fit into the box). A copy of the certificate is maintained by ECRB and is available via email and on-line to customers if you wish to re-sell your animal at a later date. This allows your customers to match the on-line certificate with the one in their hand at the time of sale. Animals are 100% guaranteed to be properly sexed. Photographs of the animal. We will take as many pictures as you want (within reason) and send them to you via email or post them on the web. Lineage information (assuming the animal was produced here at ECRB). While our breeding facility is not open to the public we may arrange to meet with our customers so they can inspect an animal prior to the sale. We are also glad to meet you at any of the reptile trade shows we attend. Unless otherwise stated and agreed upon in advance (and in writing), we guarantee that all animals are healthy and feeding at the time of sale. We guarantee that all animals are feeding regularly at the time of sale. We do not guarantee that an animal will feed under your care. All of our animals are fed appropriately sized live mice and/or rats in their permanent enclosure. We do not feed frozen/thawed (FT) rodents of any kind. We never offer African soft-furred rats, gerbils or any other ‘non-standard’ food item. At the buyer’s request we are glad to provide a recent feeding video to demonstrate the animal’s feeding response. We are unable to offer guarantees on the feeding response of an animal after it leaves our facility. We are always available to offer insight and advice if or when an animal takes a feeding hiatus. We guarantee live arrival of your reptiles unless the shipment is delayed or mishandled by the shipper. For door-to-door shipments you must be available to sign for the animal at the time of delivery. We do not guarantee live arrival for animals left by a door. All shipments must be opened and inspected immediately upon arrival. We generally do not ship animals when the temperature is under 40 or over 90 degrees (F). Shipments made under these conditions are at the sole discretion of the buyer. Animals purchased from ECRB are not guaranteed once they are in your care. This is the single most difficult aspect of a snake purchase/sale. An animal that fails to thrive in the days or weeks following their purchase is a point of strong opinions for both parties involved in the transaction; buyer’s are left without a reptile or their money and the seller cannot account for the conditions under which the animal was kept after the sale. This is true even when the animal is sold to an experienced keeper. We’re not supposed to talk about it when trying to sell snakes but snakes can and do die. On very rare occassions they do so for no observable reason (e.g. natural causes). In almost 20 years of snake breeding I can still count on one hand the number of times that an apparently healthy captive bred animal died for no obvious reason. All sales are final. We do not offer refunds. Please be sure the animal you purchase is the one you want. We reserve the right to decline any order/request for sale. You must notify us within 24 hours of delivery of any problems. If something is not correct you need to call us immediately. Do not send an email without also calling us on the phone. Photographic evidence of any problems will be required. The legality of owning a reptile in your state and/or city is your responsibility. It is not possible for ECRB to know what rules exist for where you live so you will need to determine if owning a reptile in your area is within the law. We do not sell reptiles to persons under 18 years of age unless their parent provides consent. Copyright East Coast Reptile Breeders 2018. It's mine. Triple-stamped.